Goodbye 2018, hello 2019! Another amazing year is in the books, and we are so very excited to share more incredible adventures with you in 2019! To help us put things in perspective, we checked in with the MotoQuest staff and guides to find out some of their favorite moments from this past year. We hope you enjoy reminiscing with us and we hope to hear from you soon! We were stopped in a sleepy, isolated village somewhere in northern Ecuador. 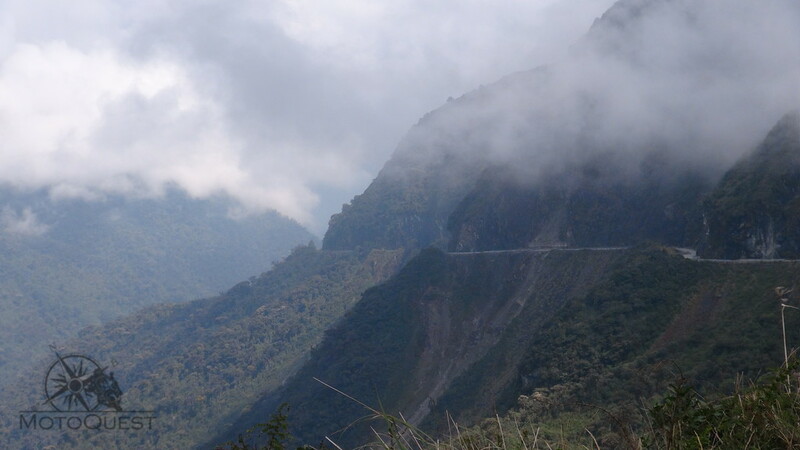 The road to get there was half paved, half gravel, and meandered along a steep river valley. Across the valley were the heavily forested slopes of Colombia. We gathered in the town center and decided to look for a lunch spot. I walked into a nearby shop, and they told me they could prepare the “daily menu” for us, which usually consisted of a juice, soup and main plate (usually a protein like chicken with rice, plantains and a salad). As we were receiving the soup course, a gaggle of school children, all in school uniforms and ranging from the ages of 8 to 14, strolled by. They double-backed and all peered in the doorway of the restaurant/shop, curiously. I asked them in Spanish who was the oldest, and they all pointed and shouted at one of the boys. The boy in question smiled proudly. I then asked them who was the smartest, and they all shouted even louder and pointed to another boy. I asked him if we has going to be the next president, and he said “Sure.” The group all laughed. There was some giggling and prodding to one of the boys, and he stepped forward to ask some questions, trying out English. For the next few minutes, they led the conversation with questions about where we were from, where we were going, and so forth. Each time a question was coming, they chose for the question to be asked by the one boy, the group’s official spokesman. It was one of those special interactions where two cultures shared a mind-opening experience. For these children, far off the normal tourist track, we were an anomaly, as if we had stepped out of the TV and into their town. We were broadening their point of view, and they were giving us insight into their culture. 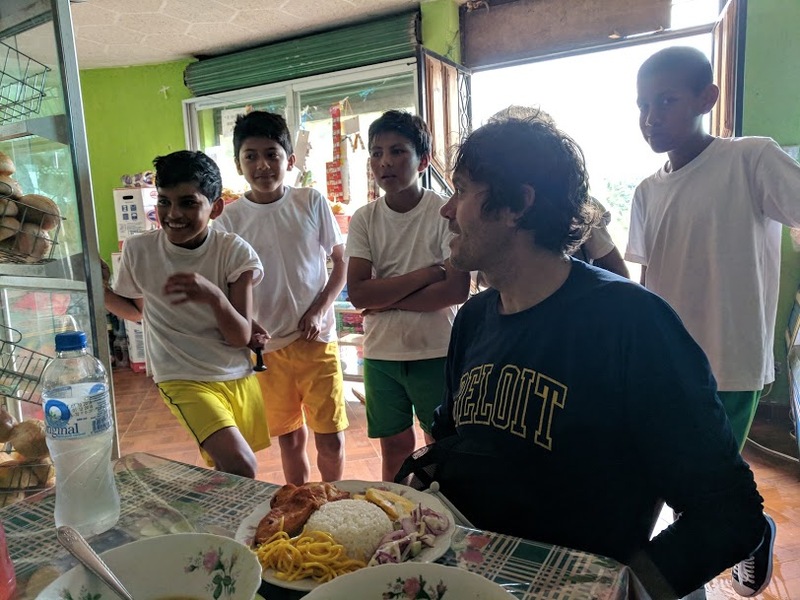 After a few minutes of a barrage of questions, one of the boys said to the their group, “Come on, let’s give them peace, they are eating.” And with that, they waved their goodbyes to us, topped with broad smiles, and drifted back out onto the street. It’s the little things in life and travel that end up being the most memorable. This moment will never leave me because it was so genuine and heartwarming. 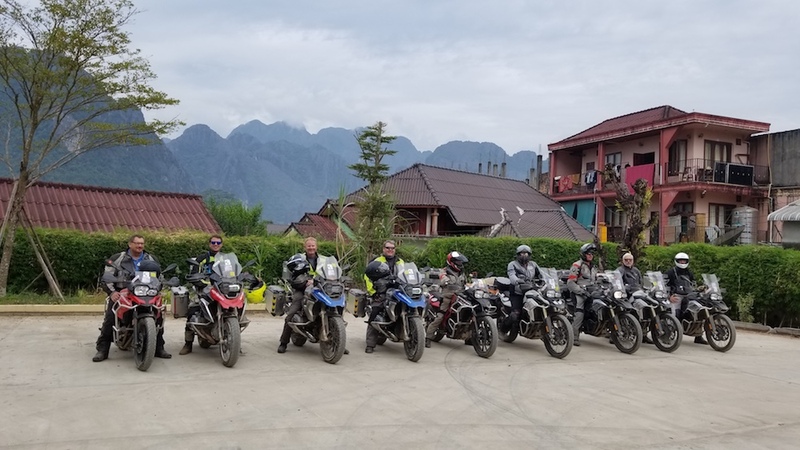 I think my favorite moment from this year was the three days of riding I did with our Thailand and Laos Golden Triangle Adventure scouting group between Vientiane and Luang Prabang. Winding through the massive limestone karst dotted landscape was second only to the friendly and hospitable locals we met all along the way. We ended this stretch with a two-night stay in Luang Prabang. Our group woke up early to give offerings to the monks, hiked waterfalls, and explored the back roads of the region. 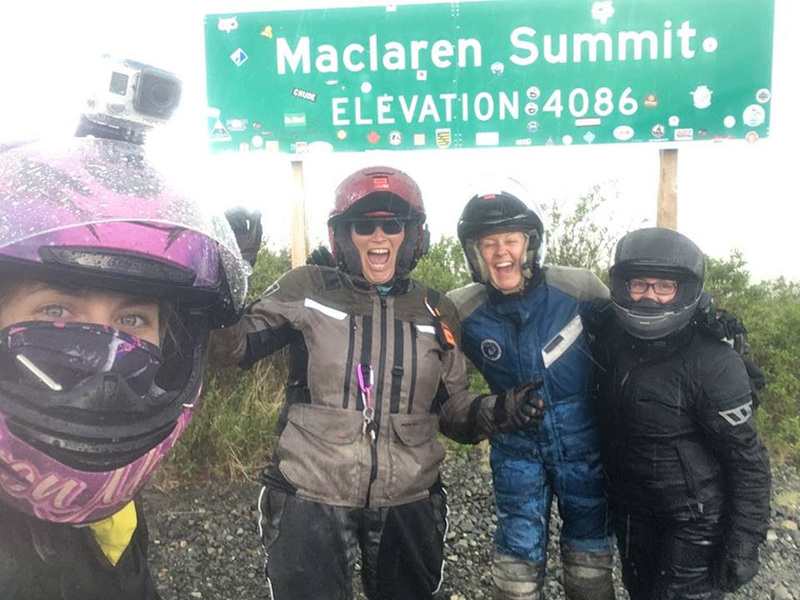 In the middle of another summer working with men in Anchorage, I got the privilege of running away with a group of adventurous women for a week of riding motorcycles around Alaska. The most hilarious moments might not be fit to be shared in print, but that makes me cherish them even more. 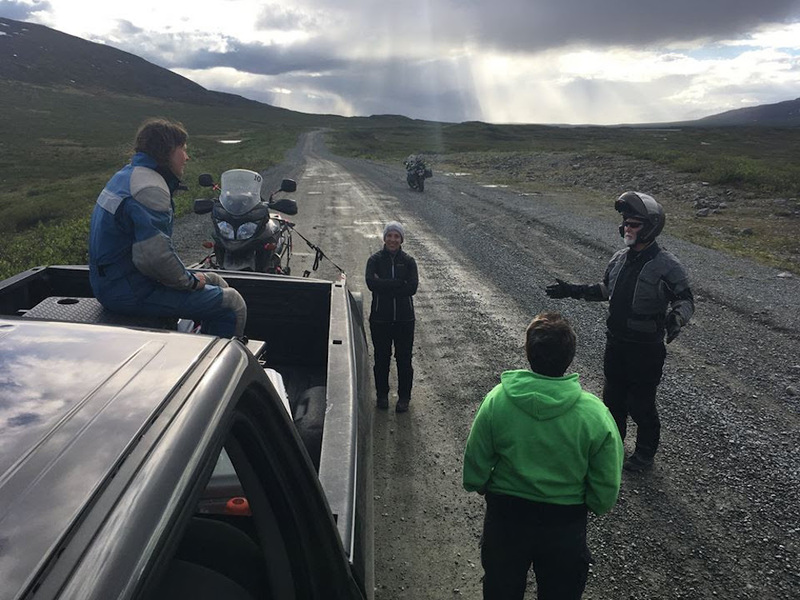 After arriving at our hotel on the final paved stretch of the Denali Highway, a couple of dirt-curious riders, my co-guide and I took four motorcycles down the unpaved section of the Denali Highway to MacLaren Summit through rain, hail, and patches of blue sky. On the way back to the hotel, we stopped to address a mechanical issue. 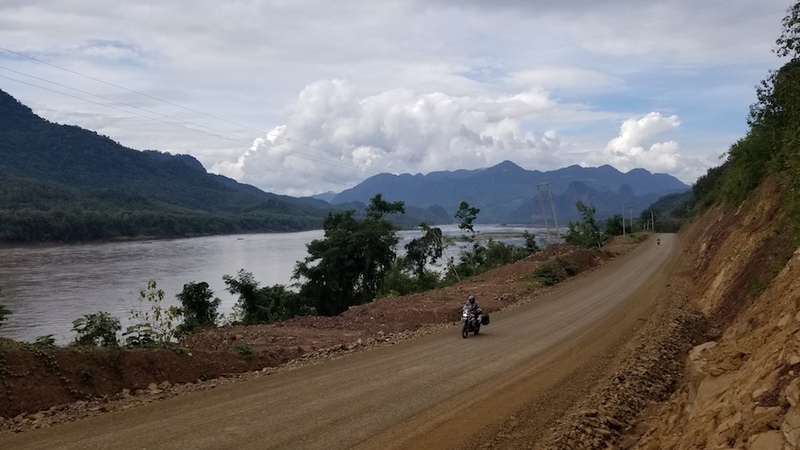 While loading the motorcycle onto the trailer to deal with it back at the hotel, a fella came riding down the road, saw us, turned around and headed our way. We collectively, desperately wanted to get back to the nice dry, warm hotel, so one rider suggested we pretend to be non-English speaking Swedish tourists so we can swiftly get on our way. Myself and the riders practiced our best false Swedish accents, saying “Ja! Ja!” and laughing at the ridiculousness of the situation while trying to hustle. We weren’t fast enough. The guy comes up, flips up his modular helmet, and turns out it was my neighbor, John! He recognized my suit and wanted to invite us to join him for a beer at a lodge further down the road. After giving him a big hug and explaining who he is to my companions, there was a boisterous round of laughter. We then took off to our own hotel, since we had whiskey waiting for us there. As a guide you are not always “in the know” regarding the clients’ experience and riding prowess. Often we ask them to relate this information during introductions at our welcome dinner. Some do and some do not. Some are truthful and some exaggerate their skills. More often, opinions are gleaned from watching them ride and how they handle different terrain and situations. During the Summer of 2018 I had the privilege of driving support for a custom tour in partnership with Wilderness Collective from Los Angeles. WC’s owner/operator Steve brought a group of five for a six-day Alaskan Adventure! 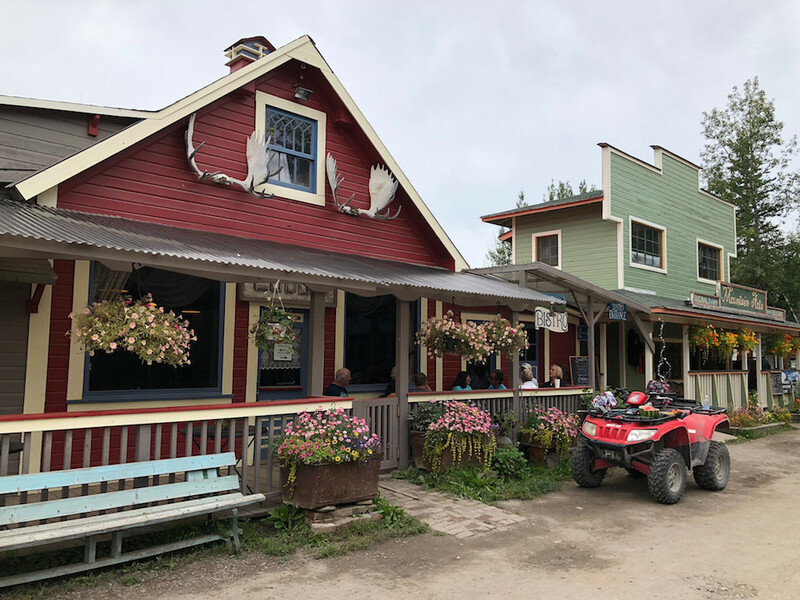 Day one was a short ride to the historic and charming town of Talkeetna, which included going up and over spectacular Hatcher Pass and north on the Parks Highway to the Swiss Alaska Inn at the outskirts of town. Arriving early afforded the group to take flight-seeing trips around Alaska’s famed 20,310 foot Mount Denali. Afterwards, we strolled into town for dinner when the conversation always turns to the day’s sights and riding adventures! This is when I overheard Travis, a mid 30’s harbor pilot from Houston, TX, enthusiastically sharing the summation of his day in the saddle. Pretty sure my jaw dropped to the table after which I told him jokingly not to share that kind of information with me again. They say all’s well that ends well and that was the case with Travis. 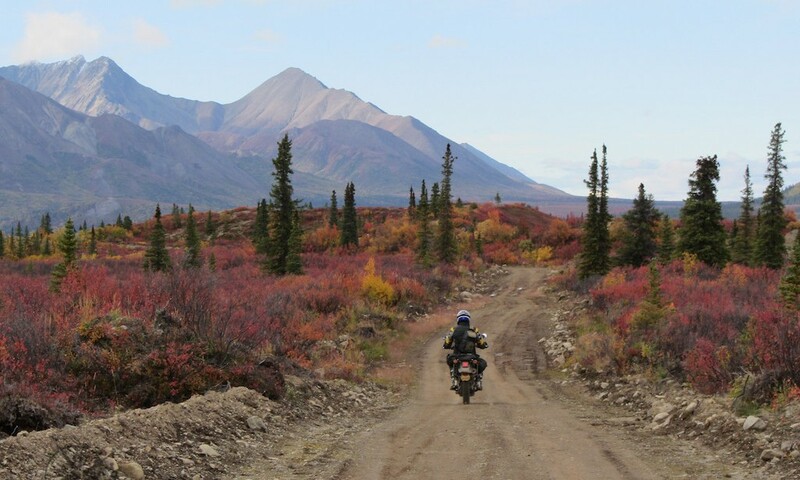 Other than a couple drops on some challenging off-road excursions, he finished the tour readily admitting he was a way better rider after his Alaska Backcountry Moto Tour! 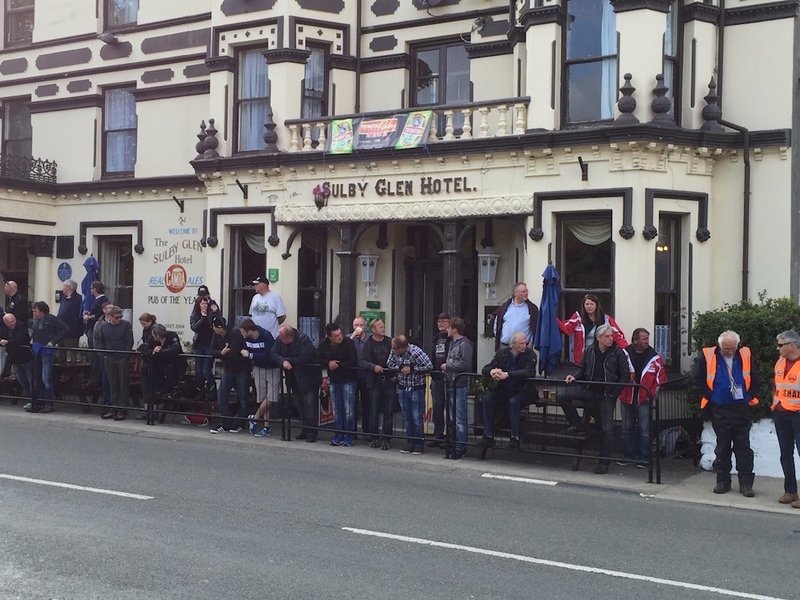 Upon reaching the Isle of Man to observe the TT qualifying times, it is a tradition that the group goes to the Sulby Glen Hotel, located on the Sulby Glen Straight. This is the fastest section on the entire 37.73-mile course. Bike speeds have been clocked here in excess of 200MPH! 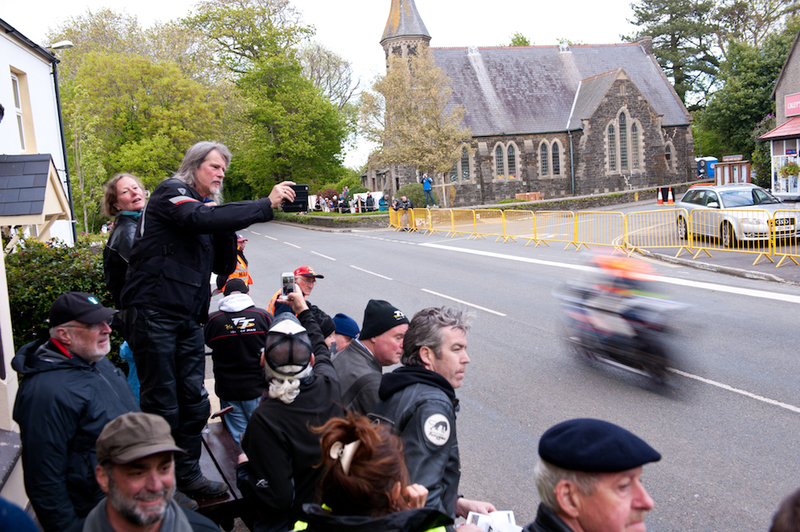 At the Sulby there is a 5-foot wide walkway and a 3-foot pipe rail fence separating the spectators from the race course. Standing at the rail, one’s toes are only inches from the course. Remember, the road course is only about 15 to 20 feet wide here. Kinda get the picture?? As our MotoQuest group is standing next to this rail with a cold glass of good English ale in hand, waiting for the racers to zoom by, I suggest they cover their glass of ale with their hand to prevent the foam from being sucked away as the racers blast by at 200MPH, just a few feet away from them. The smart ones in the group comply with my suggestion, but the ones who laugh off my suggestion find out after a few racers go past that there ale is covered with what looks like small particles of black pepper. This substance is actually rubber from the rear tire, which is spinning at high speeds in an attempt to keep as much traction as possible. There are believers and non-believers…. The thrill of speed can really be grasped at the Sulby Glen Hotel. 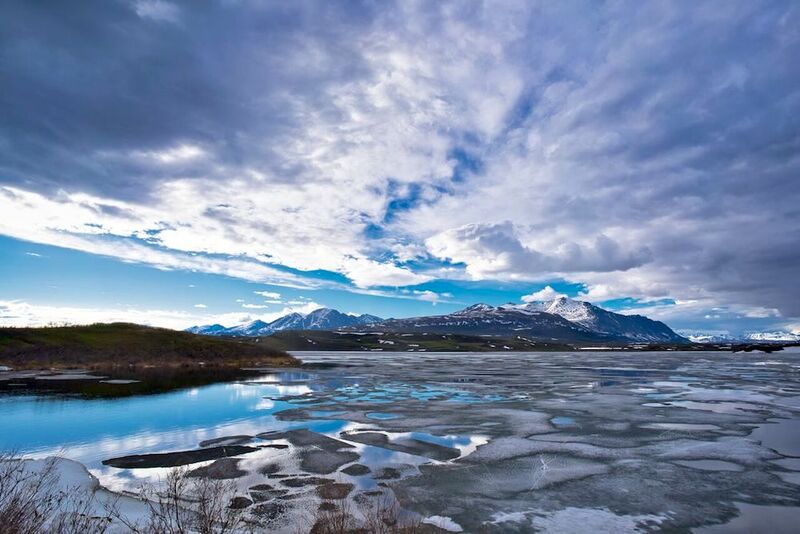 This is a “you had to be there” story from a dinner of one of our custom tours in Alaska. We had started the day in Tangle River along the Denali Highway and headed to McCarthy, situated in Wrangell-Saint Elias National Park, the largest park in the USA. When riding in Alaska, we always plan our lunch stops well ahead of time, as our choices can be very limited. On this day, we would ride 170 miles and stop for lunch in Chitina. While our group of riders was having lunch, our support guide opted to skip lunch so he can check the bikes closely prior to venturing onto the 60-mile dirt road that leads to McCarthy. Upon arrival in the very quaint village of McCarthy, it’s as though we had stepped back into the early part of the past century, and we checked into our quaint hotel from yesteryear, Ma Johnson’s. For dinner, our choice was limited to bar food in the bar across the street, or fine dining at the Bistro next door to the bar. Since we had a long day in the saddle, most of our guests opted for the fine dining option and gathered on the deck outside the Bistro for some pre-dinner refreshments. At dinner, one of our riders commented to our support guide that he must be really hungry since he didn’t eat lunch. “Yes”, he replied, “I’m famished” and he decided to order gnocchi and beets as his main course. A few other guests also ordered this as their entrée and we waited to be served. Finally, our entrées arrive. 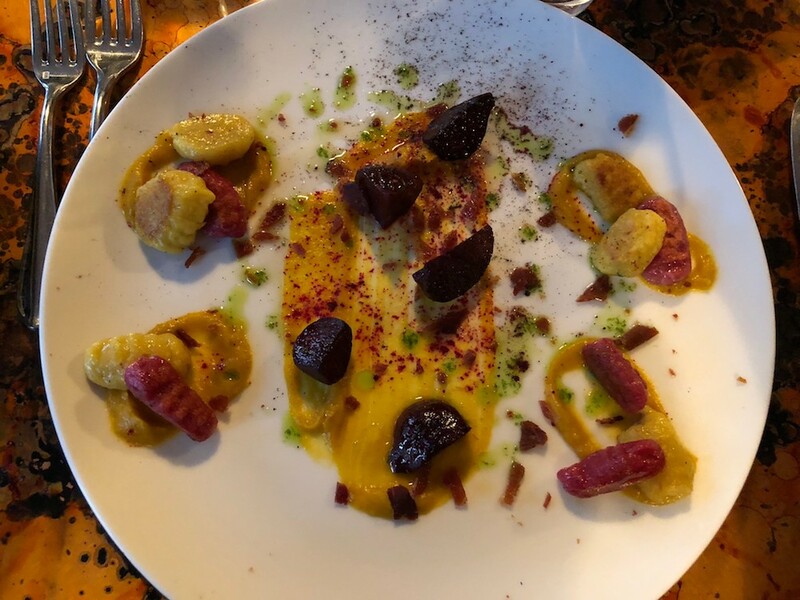 Behold our gnocchi and beets dinner! Upon eating it, our waiter asked our support guide if he would like dessert to which he replied, No thanks, I’m full.” At this moment, everyone at the table burst out laughing, much to the confusion of the waiter.